This might seem a little absurd, but it is a rule. In formal dining, you must always have one part of the menu touching the table. It might be a natural instinct to bring the menu closer to your face, but for fine-dining etiquette you must ensure to have the bottom of the menu, or at least one part of it, still touching the table. Once you sip from a glass, you must sip from the exact same place on that glass for the rest of the evening. The purpose of this is to avoid the lip ring that occurs when you sip from a glass, whether it’s from natural oils, chapstick, or lipstick. You must also put the glass back in the same place where you picked it up from. The less noise we make the better, as the clinking sound can be off-putting. Also, there’s the chance that you can damage the glass, especially while fine-dining as they often use very fine glassware. Don’t ask for an oyster fork if there isn’t one. When there isn’t one on the table, it means that the oyster is already separated from the shell and is ready to eat. If part of the oyster is still attached, you can just use your knife to gently loosen it. Once you’ve eaten the oyster, you should turn the shell over on the plate to indicate that you are finished. This is just a courtesy for the service staff who have to clear the table and will be touching the edges of the plates. It also doesn’t look good if you seem like a messy eater. Typically, the upper left part of your plate is where you place discards you don’t want anymore. For example, a fish bone or lemon rind would go on the upper left hand part of the plate. The bottom right is for sauces and butter. Unless you are putting the bread in your mouth, it should be on the plate at all times. That means you should butter the bread while it’s still on the plate, but also do not butter the whole slice of bread at once. Break off the piece you plan to eat, butter it, and then lift the piece into your mouth. This also applies to muffins, bagels, biscuits, and other bread products. Fold your napkin in half with the crease facing toward you before putting it in your lap. It’s also a rule to dab stains rather than wipe them, and then close the napkin. This way, all the stains are closed inside the napkin and keep a neat presentation for your guests. Never say you have to use the restroom; just simply excuse yourself from the table. No one really needs to know that you’re going to go to the washroom anyway. This shows that you enjoyed the meal, but weren’t so hungry that you cleared the entire plate. By clearing the entire plate, you could signal that you are still hungry, or that it wasn’t enough food. You always want to look like you eat in moderation. All these rules must seem very overwhelming, but at least we don’t have to follow them every day. For some, these rules may seem silly, but they are real standards that others follow regularly. 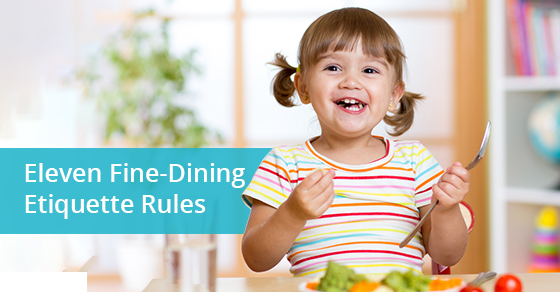 Having good dining etiquette is always better than having no etiquette at all. To learn more about fine dining, call Le Jardin at 1-888-529-8573 or contact us here.